M.A. Vega-Palas, A.-L. Paul, and R.J. Ferl, Chromatin. Z. Wilson, Molecular Genetic Analysis: Chromosome Walking, Gene Tagging, and RFLP Analysis. R. Walden, Vector Systems for Agrobacterium Transformation. R. Goldbach and T. Hohn, Plant Viruses as Gene Vectors. Subject Index. 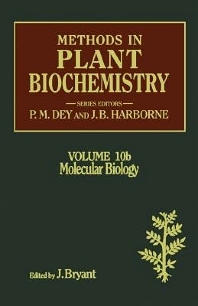 Methods in Plant Biochemistry is an authoritative reference on current techniques in the various fields of plant biochemical research. Under the expert guidance of guest editors, each volume provides comprehensive, practical information on the assay and analytical techniques appropriate for a particular family of plant compounds. The series emphasizes techniques and laboratory procedures. No plant biochemical laboratory can afford to be without this comprehensive and up-to-date reference. Royal Holloway and Bedford New College, Surrey, U.K.
University of Reading, Whiteknights, U.K.
Joy L. Bryant holds an M.A. in Applied Science—Patent Practice from the College of William and Mary and an M.S. in Polymer Science from the University of Akron. She is registered to practice before the U.S. Patent and Trademark Office as an agent. Bryant is currently in private practice in Virginia and is the Founder and President of the National Association of Patent Practitioners (NAPP), a nonprofit professional association for patent agents and attorneys. Prior to starting her own practice, Bryant was employed as a patent agent in the Office of Patent Counsel at NASA Langley Research Center and an industrial polymer chemist. She has also developed three commercial products, one of which is patented. President of the National Association of Patent Practitioners, Newport News, Virginia, U.S.A.